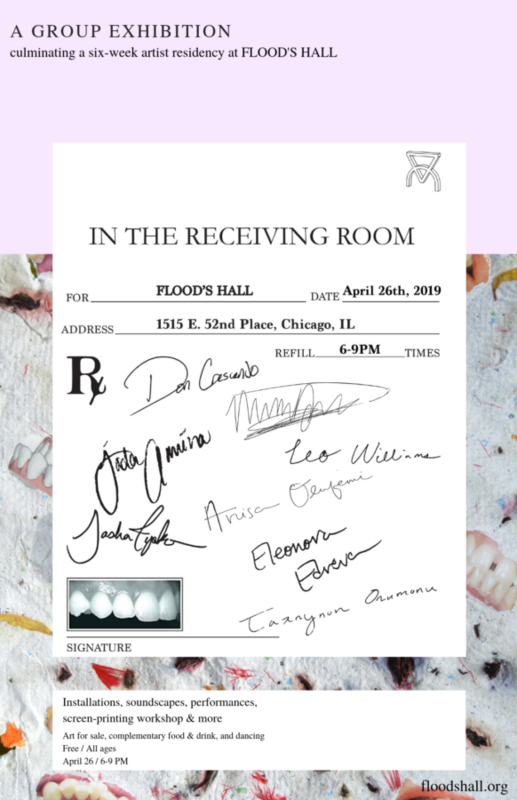 Set to place at a repurposed dental suite, IN THE RECEIVING ROOM is the culminating exhibition of works produced by artists Don Crescendo, Sasha Tycko, Jada-Amina, Leo Williams, Tarnynon Onumonu, Elenora Edreva, and Nico Valdez over the course of a six-week artist residency hosted by Floods Hall, a developing community resource center. Floods Hall’s founding artists-in-residence program aimed to facilitate a generative, communal space for artists of different backgrounds and disciplines. The residency encouraged each artist to explore potential collaborations as they engaged new processes, materials, and concepts within their own independent studio practices. IN THE RECEIVING ROOM will present a wide variety of works investigating notions of place, timing, distance, interaction, and the lack thereof. In this exhibition, the impersonal nature of commonplace clinical environments is challenged by a series of intimate full-room installations, soundscapes, and objects that invite the viewer to contemplate how they go about receiving the world around them in the process of their day to day observations. The work of each artist prompts a critical examination of the ways in which the individual perception, and in turn that of the masses, produces a distinct algorithm of social, geographic, and psychological transfigurations — alongside a slew of inherent misconfigurations, and blind spots. There is elevator access to the third floor, and a wheelchair-accessible restroom in the space.